Published: Nov. 4, 2012 at 10:40 a.m. Updated: Nov. 4, 2012 at 09:31 p.m.
New Orleans Saints coach Sean Payton's contract status still is up in the air. And only NFL Commissioner Roger Goodell can decide on it. NFL.com and NFL Network's Michael Lombardi confirmed Sunday that the league voided Payton's contract extension, which he received in 2011, because of concerns about the language in it. The Saints and the NFL discussed the issue many times, but they never found a resolution. 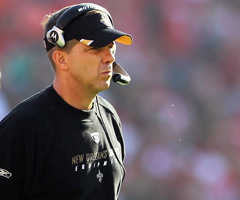 Payton's contract now is scheduled to end in 2012, but that doesn't mean he'll automatically be a coaching free agent after this season. A source familiar with how the NFL operates in these situations cast doubt to NFL.com and NFL Network's Ian Rapoport on if Payton would be a free agent. Lombardi also reported that many people in the league believe Payton's contract will carry over -- or "toll" -- into the 2013 season. When a player is suspended, their contract essentially is pushed back a year. The suspended year doesn't count. It's believed the same logic will apply here -- Payton is suspended for the season over his role in the Saints' bounty scandal -- meaning the coach would be under contract in New Orleans through the 2013 season. Ultimately, that decision is up to Goodell. Lombardi pointed out that Goodell has the unilateral right to rule on coaching contracts. "Our office has made no determination on Sean Payton's contract status with the Saints for next year," NFL spokesman Greg Aiello said in a statement given to Rapoport. "All contracts between clubs and their employees must be approved by the commissioner, and we do not comment on specific terms of individual contracts. Any comment regarding the matter should come from Coach Payton and the Saints." Goodell later spoke to reporters at a fan forum in Atlanta and confirmed he had voided Payton's contract extension, which was scheduled to run through the 2015 season. "Now it's up to the team and Sean Payton," Goodell said, via Rapoport. "Until I get something back, it's up to them." UPDATE: Payton told Fox Sports insider and NFL Network contributor Jay Glazer that "I absolutely plan on being a New Orleans Saint."